There was a grim inevitability about the tragic death of Amy Winehouse, which abruptly ended a spectacular career that started with her emergence as one of the most iconic voices of her era, bringing with it a deluge of fame that may have accelerated her tortured descent into drugs and premature death on July 23, 2011 at the age of 27. The daughter of a Jewish jazz-loving taxi driver from North London, Amy was already singing in a rap group, Sweet 'n Sour by the time she was 10, was playing guitar at 13 and writing her own songs at 14 before joining the Sylvia Young Theatre School. She was later expelled but went on to study at the BRIT School in Croydon and her precocious talent became obvious when she sang with the Bolsha Band and, in 2002, was signed to Simon Fuller's 19 Management company. 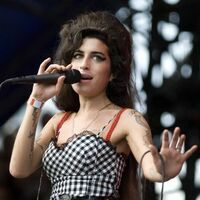 With her distinctive beehive hairdo and a passionate, smoky vocal style that drew comparison with some of the jazz greats she revered so much, Amy struck it big with her mostly self-written debut album Frank in 2003. Its sales paled into insignificance, however, alongside 2007's Back To Black, which included her most defining track and biggest hit single Rehab - brilliantly produced by Mark Ronson. Other hits followed, including Back To Black and Tears Dry On Their Own, while she also had a hit singing Valerie on Ronson's own album. A year later, however, lurid headlines began to emerge about her erratic behavior as her drug-taking spiraled out of control and her live shows - previously one of her strongest points - also began to suffer. Recording sessions to make a follow-up album to Back To Black foundered along with attempts to get her life and career back on track and Amy died at her home in Camden, North London. ℗ 2015 Universal Island Records Ltd. A Universal Music Company. ℗ 2008 Universal Island Records Ltd. A Universal Music Company. This Compilation ℗ 2007 Universal Island Records Ltd. A Universal Music Company. ℗ 2007 Universal Island Records Ltd. A Universal Music Company. ℗ 2006 Universal Island Records Ltd. A Universal Music Company.